(1) The Siren 500 M05 electronic siren serves to alert the fire and rescue services and to warn the public in the event of an emergency. 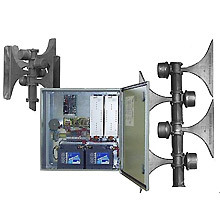 (2) The system consists of an electronic control unit and four acoustic radiators. (3) The current required for operation is taken from two absolutely maintenance-free lead batteries. Prolonged operation is guaranteed even in the event of a power failure. Mains-independent operation on a solar power supply is also possible as an option. (4) The control unit contains 2 short-circuit proof, overtemperature-protected low frequency amplifiers with 250 Watt output power each. (5) Digital signal processors DSP generate the necessary audio frequency signals, control and monitor the power output stages and simultaneously measure the functionality of the acoustic radiator systems connected to the outputs. Differences in impedance of the radiators, variation in voltage of the batteries are also monitored and automatically set, if necessary, to the nominal power output. (6) The SLG98 power supply unit provides a temperature-compensated and conserving charging of the batteries. It also supplies the voltages required for the system. For feeding of a two way-radio a 12 volts / 0.4 A power supply is already built in. This unit also contains the charge controller for an alternative solar energy supply. (13) A radio control and a handheld microphone with preamplifier can be integrated in the cabinet as options.